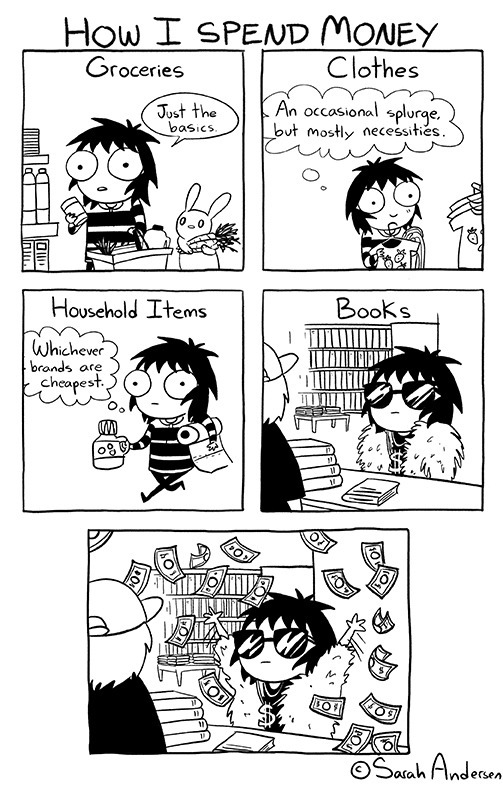 ‘How I Spend Money’ by Sarah Andersen. Or, an unintentional biography of my life. Last Tuesday marked the 27th anniversary of my birth. Having thrown a party for the last few years or so, this year I didn’t really feel like arranging anything, so just went for a nice breakfast at Bill’s with my boyfriend, the pair of us having booked the day off of work. I had blueberry pancakes with fruit, bacon and maple syrup and it was absolutely delicious. After that I dragged Mark to Waterstone’s, and somehow wound up with 6 new books to read and enjoy c/o Mark’s never-ending generosity and my own inability to control my spending. I actually think I own more unread books than read ones. This is either a very good thing, or a very bad thing, depending on how you look at it. Seeing as Mark had his weekly game of football, I then spent the evening with my best friend Cassie, cooking cheesy veggie risotto and watching Season 5 of RuPaul’s Drag Race (my latest guilty pleasure). Cassie was also kind enough to deliver a beautiful handmade present from both herself and Kim (K.F. Goodacre): my actual wand from the Harry Potter universe. Does anyone remember Pottermore? Ah, Pottermore… Everyone got so excited when it was first announced. Like many others of the ‘Harry Potter generation’, I signed up to be a Beta tester as soon as I could and was fortunate enough to be granted (very) early access. There’s some cool stuff on there, like extra little writing and character titbits uploaded every now and then by JK Rowling. Ultimately however, after I was sorted into my house, it turned out to be a bit of a disappointment. The interactive book explorations, although beautifully illustrated, were simplistic and lacking in true content, plus the only book available was about two thirds of Harry Potter and the Philosopher’s Stone. The galleons system was pointless, because once you’d bought all your books, there wasn’t anything else you could buy except for a new cauldron that cut your potion brewing times in half. Potions-brewing was of course the only way you could earn House Points, along with spell casting which was extremely difficult and required another participant. Also, whilst you were able to adopt a pet (I adopted a black cat of course), you were not able to give it a name or anything fun like that. I’ve been led to understand it’s undergone a bit of an overhaul recently with a new version of the Sorting Hat quiz and a Patronus test coming soon, but I don’t think I’ll be going back there in a hurry. According to JK Rowling, laurel wood and Unicorn hair are both difficult to turn to the Dark Arts, which is a bit annoying what with me being a Slytherin and destined to conquer the world and everything. I remember every wand I’ve ever created, but to my (perhaps prideful) embarrassment, yours was not carved by my hand. In June 1977, a work experience student by name of Severus Snape – whom I remember listening to banshee-like, wailing muggle music and wearing only black – made eight gothic designs out of my most expensive laurel. They were all very well-made to his credit, but distasteful to many of my customers (or their parents) at the time. I altered most of the designs to make them more conventional, but each time I tried with yours I got an unpleasant zap! I hope you are not put off by the carving. The wand seems proud of it. Genius. It’s like, the most metal wand ever and I love it.